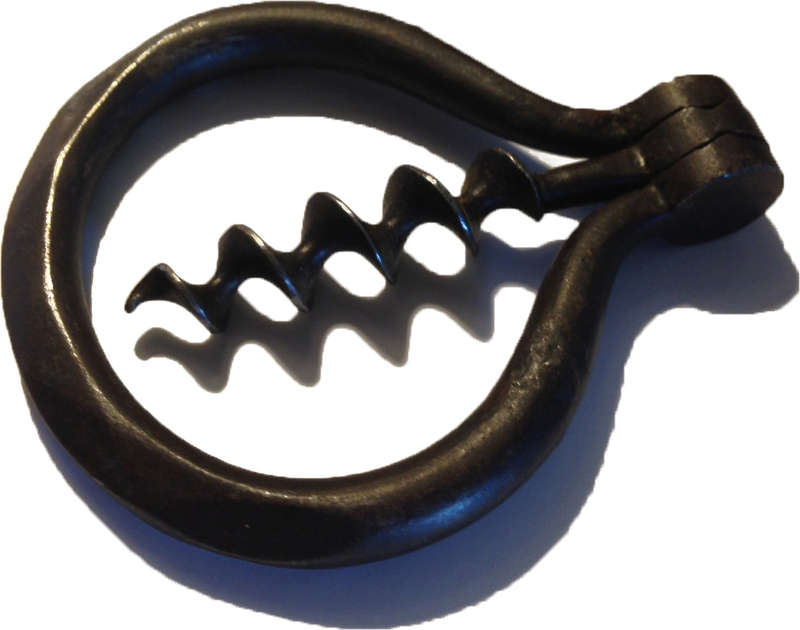 The Codd patent corkscrew arrived today, and it is definitely a cool looking corkscrew. The usual suspects have been making offers to buy it, or trade for it. But this one? This one, is staying put! 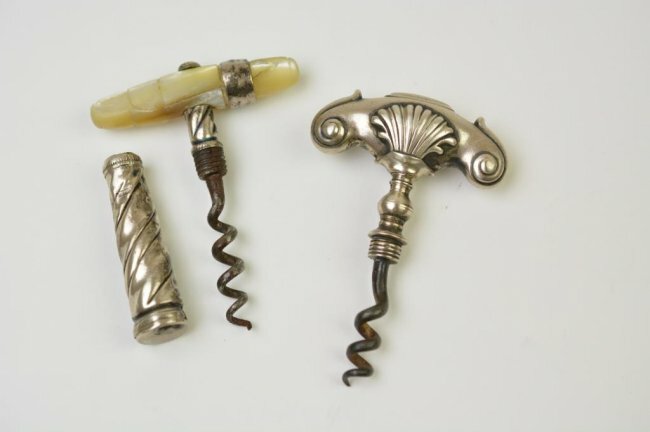 A couple of weeks ago, a non-ebay auction was advertised, and within the myriad of items to be auctioned off, a collection of corkscrews were to be part of the auction. With a poor picture to go with, I made contact with the auctioneer, who explained that I should call him the week of the auction, and so I put it on my calendar to make contact. He answered his phone, but suggested that I call him on Wednesday between 9 and 11 am. I agreed, and on Wednesday at 10 am, he called me. We spoke a bit about the auction, and the lot. 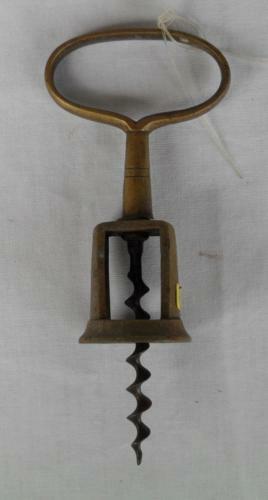 And, he explained there were 18 corkscrews, although the picture from his auction site only showed 8. I asked him if he would shoot a couple of pictures and text them to me. Of the 18, there were only two that I was after, and it was the same two that I had seen in the original 8 that prompted me to contact him. I hemmed and hawed a couple of moments, and told him my numbers. This evening. I did have a phone conversation with the auctioneer, and it seems that I did get the first choice. And, I did get the second choice. And, it may have well happened, that I could have had the third, fourth, fifth, sixth, seventh, eighth, ninth, tenth, eleventh, twelfth, thirteenth, fourteenth, fifteenth, sixteenth, and seventeenth choice in the auction, but it was only two that I really wanted. And, truth be told, it is was only that first choice that was the must have, must bid, must win corkscrew. And, so since I must have it. I bid, and I won! 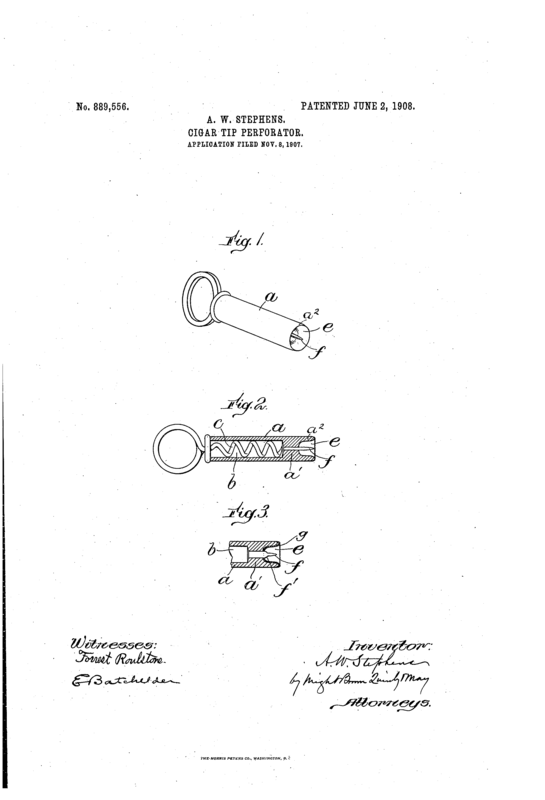 The Hiram Codd patent of 1881, marked Codd’s Patent” and “GF Hipkins & Son” was the first choice. And, the celluloid Indian was the second choice. 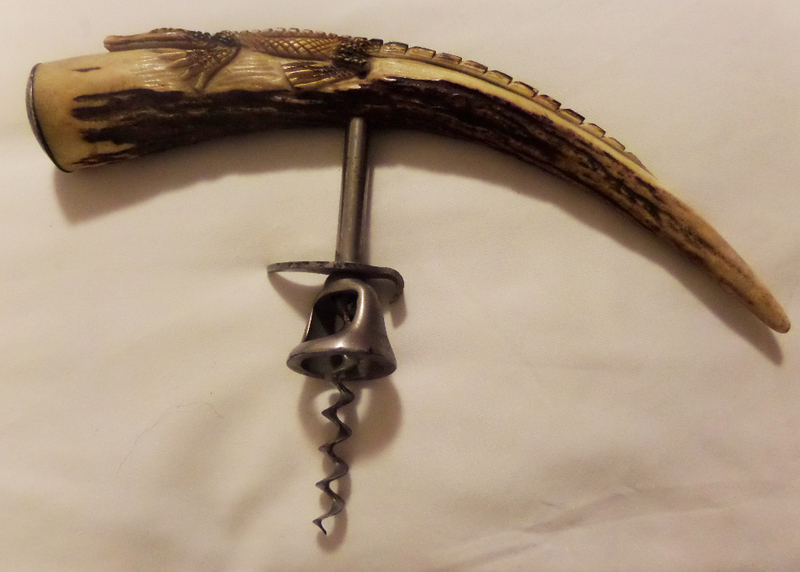 A very nice corkscrew to add to the collection. And, a best 6 candidate? It seems that I have left the blog un-updated for a few days, and I was alerted to this fact by one of my loyal readers. Sorry loyal reader, I will not let this happen again. There have been a couple of corkscrew deals over the last week or so, and one that hopefully will come through tomorrow. 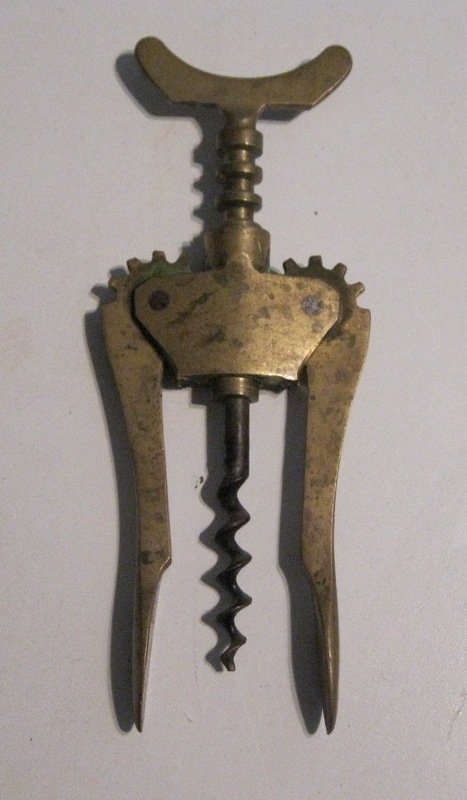 I have placed an absentee bid with an auction house on two corkscrews, and we will know tomorrow night if said bids are successful (fingers crossed). And, I finally have gotten a Preston patent. 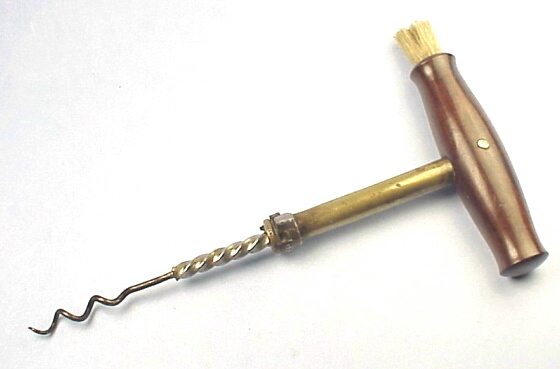 Not that the Preston is horribly rare, but it seems that I have found a dozen of those Williamsburg brass reproduction corkscrews over years, but haven’t ever been able to pick up a Preston for a fair price. Finally one came up with a fair price! Also newsworthy is the aforementioned AUTOMATIK corkscrew. I sent an email off to Ferd about this, and his response was that he had never seen it before. And, one of the category leaders from Screwbase emailed to ask if they could put it into the update, as this example doesn’t appear in their database. 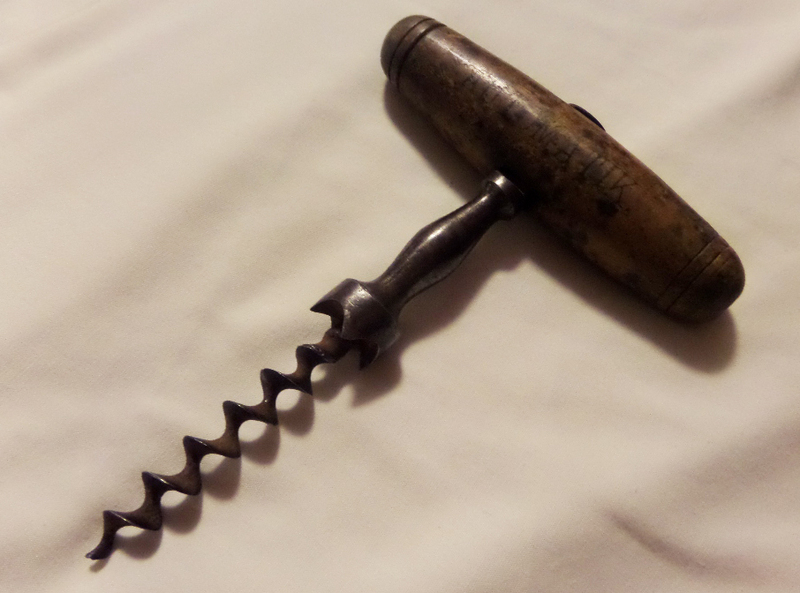 It would seem, that the minor Brimfield purchase (which was partially paid for in trade with five-dollar kitchen tool, I found across the very same field), might actually be a pretty decent corkscrew. 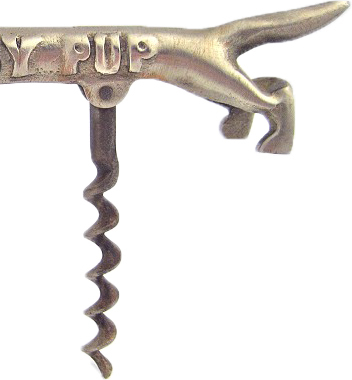 And, then there are these little picnic corkscrews. They came at a fairly low price, which is fortunate given their condition. I am figuring one of these will end up on the ICCAuction next month, but as they have yet to arrive (from an Auction house in Canada), I will have a better idea in the coming week. 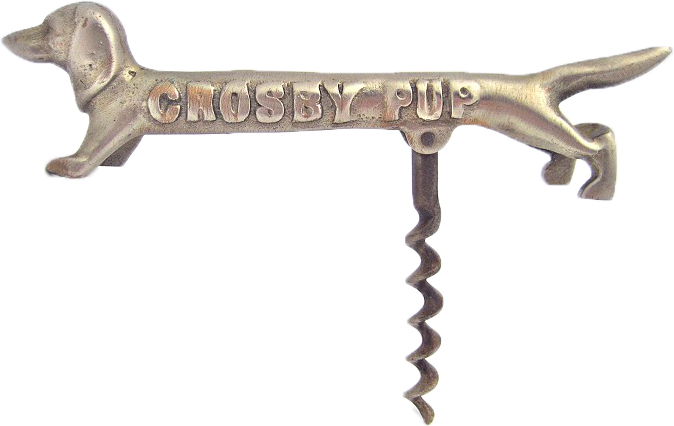 Oh yes, I was contacted by a magazine this last week, and they will be doing an article on vintage corkscrews in one of their upcoming issues. I have mailed off a dozen (less expensive, as that is what they were after) corkscrews for their photoshoot, and it will be fun to see how the article and pictures turn out. I will let you all know when the magazine is published so you can pick up an issue. The other big news, is that Tommy is coming out to Maine for a visit next month. Will trades be made? Will corkscrews be found? How many lobsters will be consumed…? I will report back here with tales of our adventures! 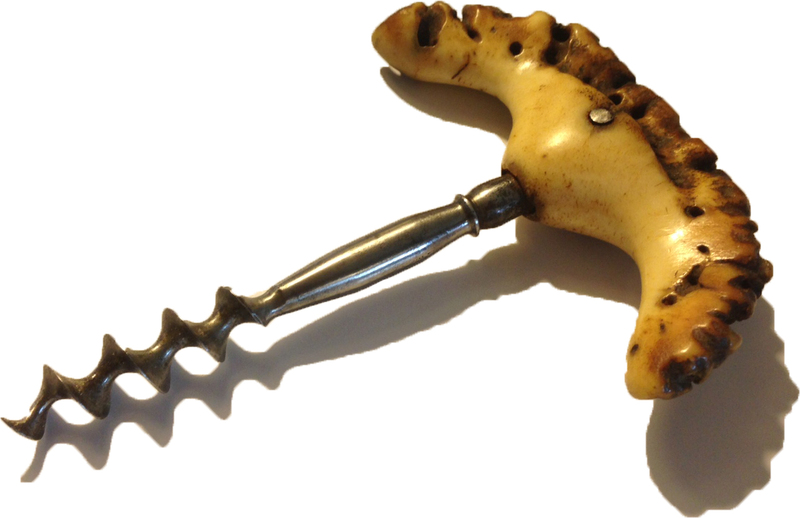 That said, there have been some interesting corkscrews as of late, and I received an email yesterday offering me a fantastic American corkscrew. The price is a little steep, but we are in negotiations for the Van Gieson patent! While Brimfield will continue through the weekend, I knew that I would only have an hour there after the first field opened, and then I would be hitting the road to make the 5 hour drive back to the boat, and then–if all worked out–I would make it to the island early evening. But before I hopped into the Mini to head back to Maine, there was some corkscrewing to do. So, given it is Thursday, it was destined to rain. As, if it is Thursday at Brimfield, it means it is May’s field. And, if it is May’s field, it means…rain. And, shortly before the field was set to open, it was raining cats and dogs. I even stepped in a poodle. Still, with word that it was just passing through, we dutifully lined up at the gate of May’s and waited for 9 am. With the gates opened, I made my along the various aisles looking (and asking) corkscrews. Nothing really worth buying, but I did pick up a nice t with brush. Knowing that I only had an hour, I made my way to a dealer’s booth that happened to have a corkscrew that he wanted to part with. I had seen it on the first day, and had discussed it with Barry–who also knows the dealer. We had talked price and condition, and as I walked up to the booth Barry was completing the deal. and I get the other half. Not that we actually cut the little guy in half. Instead it will be put up for auction, and we will split the profits–with the winner getting the whole puppy. With the Stephens the first day of Brimfield (definitely a best 6 candidate), the alligator the second day, and half a crosby pup, as well as all the other corkscrews that found their way into my backpack over the course of the two days and one hour, I would have to say it was as successful Brimfield adventure. And, I even made it back to the boat in time!!! I will preface this by saying again, it was a fantastic idea that the lovely bride had to bring the espresso machine with me! This morning was another early one, and in the darkness I drove the mini to the fields of Brimfield. With the first field opening at 6:00, and having arrived with plenty of time, I followed yesterday’s plan of seeking out more coffee (although, I did start the morning with three espressos). After buying my ticket and getting in line, the time neared when the gates would open. I hadn’t seen BT at all, but I assumed he was at a different gate. As the masses (which weren’t really a mass) made it through the smallish openings in the fence, I stepped into the first booth and let everyone walk, run, jog, or stampede past to get to something that is (hopefully) other than corkscrews. Truth be told, this particular field has never really netted out any great (or even good) corkscrews for me. There have been a couple of openers that made their way to the JFO, some Anri stuff that ended up on eBay, but nothing to write home about–or here for that matter. That is not to say others haven’t had luck. If I remember correctly, TC picked up a Mumford at one guy’s booth last year. So, I today I walked through the field hopeful, but not really expecting anything. And, as luck would have it. That is pretty much what I found. I did find some overpriced Stag and Sterling handled corkscrews (in the 400+ range) and I did find an unmarked Hercules for 10 dollars, which I did buy as things were going rather slow. 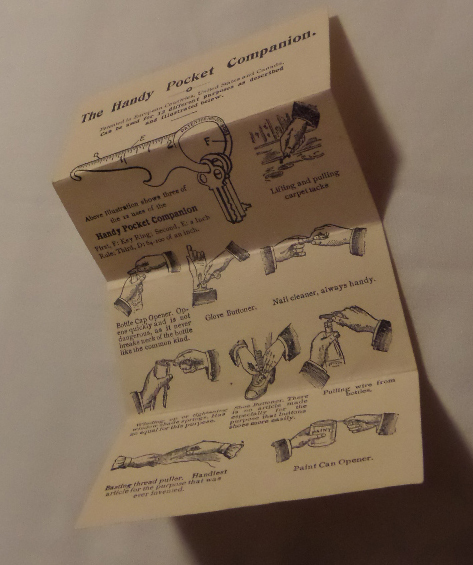 And, I grabbed a stag handled direct pull with a fancy shank–this was inexpensive as well. And, that what was in the field. Hopefully “Heart of the Mart,” would provide more (read better) opportunities. After a bit of breakfast (and more coffee), I met up with Barry and we headed to the next field, which would be opening fairly soon. And, with the gates opening (significantly wider than the previous field) Barry headed towards the back, and I headed left. 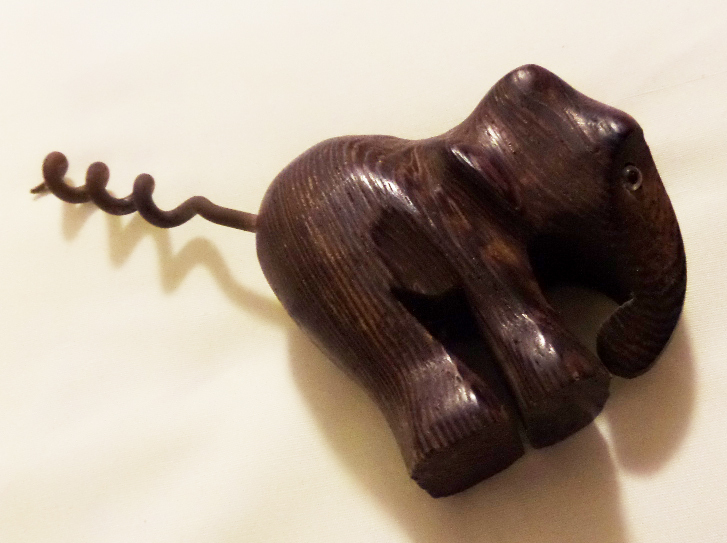 I handed over the cash, and made my way to the next booth, where I bought a small wooden elephant corkscrew. He was cheap, and why not? By the end of the second aisle, I saw a few familiar faces. The dealers that I saw in Damariscotta, Maine a few weeks ago were there, and as I walked up, one of the dealers walked to her van and pulled out to small packages for me. One, contained a lovely Sterling roundlet. 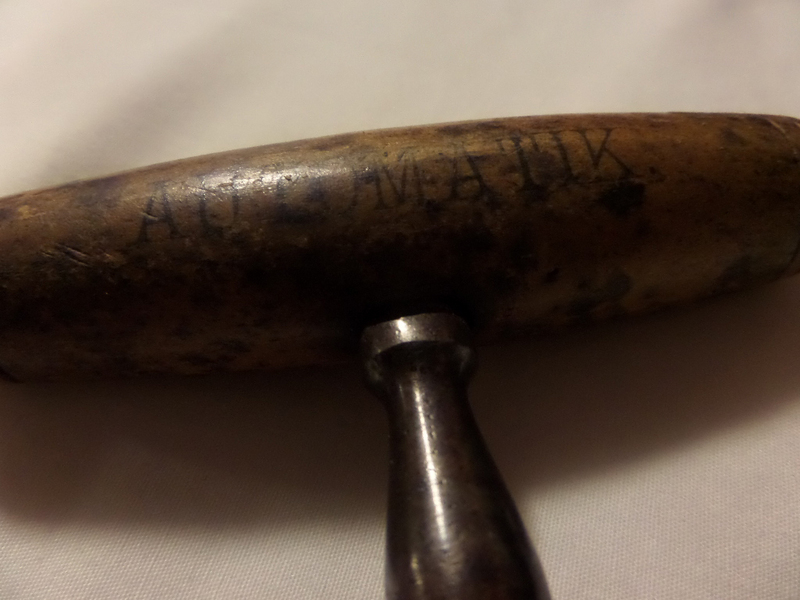 The other, a nice stag handle with Sterling end-caps with a Gorham mark. I thanked her for bringing them for me, and she quoted the prices. I took the roundlet, and paid with no haggling, and suggested that she put the Gorham one out for sale, but she should up the price a bit. We said our goodbyes, and I was pleased that for the fourth time in the last four Brimfelds I have attended, they have had a corkscrew waiting for me when I have approached their booth. I did like the roundlet, but I really don’t need another Sterling one. I mean, it was nice and all, but I have about 20-30 of them. On the other hand, I HAD to buy it. 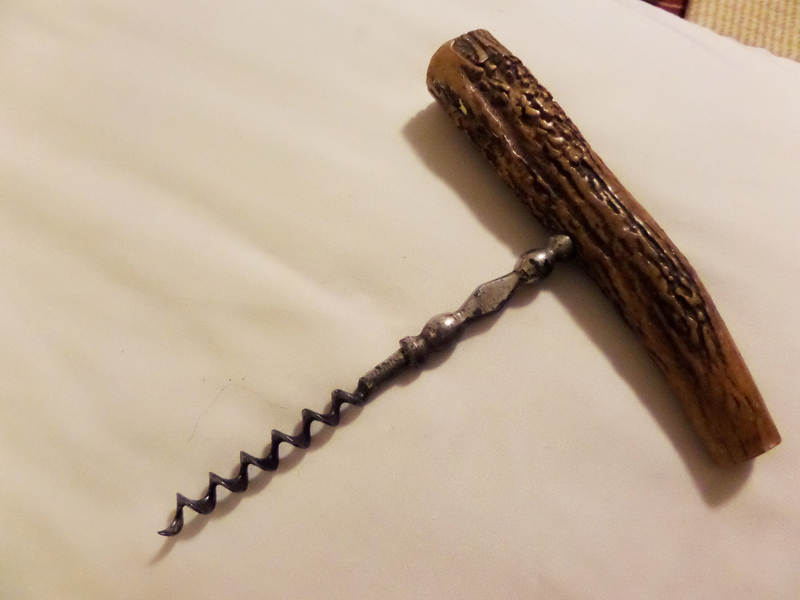 They save these corkscrews for me, and as I want them to keep saving them for me, I felt compelled to keep the relationship going. Not to long after that, I ran into BT. He had picked up a couple of things, and I showed him the roundlet. He liked it, and I offered it to him, but apparently he too doesn’t need another one. As we parted ways, Barry headed off to retrace my steps, I headed off to cover the area where he had previously been. And, as often is the case, neither of us missed anything. With a little time to kill before the next field opened, I headed off to see if a dealer who has been promising me that he would bring his collection for me for 6 years. On my back to the next field however, I happened to run into a silver dealer I know, and I showed him the roundlet. He thought it was fabulous, and so the Sterling Roundlet found a good home, and I turned a small profit for taking a corkscrew for a walk. At the last field of the day, there weren’t many corkscrews about. 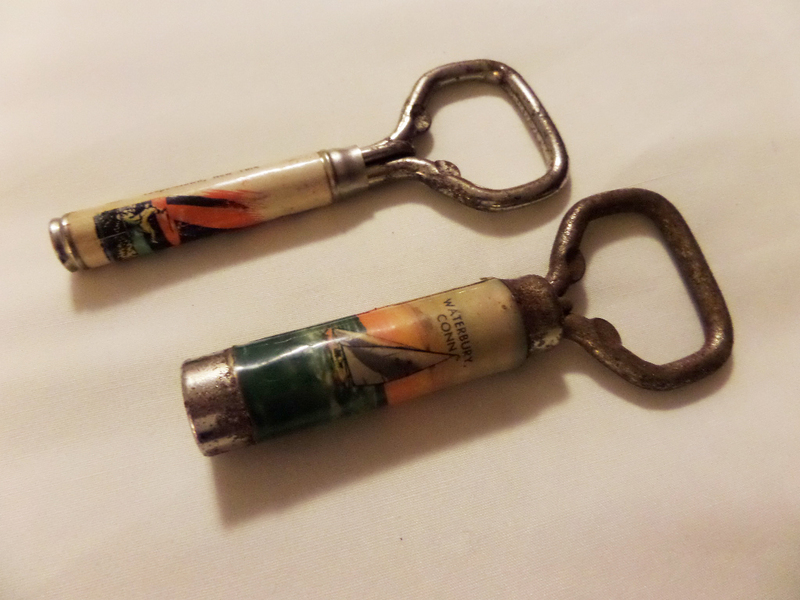 And, while I haven’t talked to Barry about what he had found, I did pick up a couple of Williamson Flashes. Not GREAT finds, but one is a metal sheathed one, and a souvenir for the Baseball Hall of Fame. As I have never owned a metal one before, I was quite pleased with the 5 dollar price. With this final field of the day, thoroughly searched, I headed back for the mini, and headed back to the hotel for an espresso. Okay, not really, but I considered it. Did I mention how having an espresso machine in your hotel room is the best idea EVER!!!!! All in all, a nice day two at Brimfield, with a snappy alligator being added to the collection. Tonight BT, MT, and I will be headed to the Student Prince for dinner. And, tomorrow May’s field will open, and we shall see if any corkscrews will be found before I have to start heading towards home. I will have to admit, that the evening before (and sometimes several days before) Brimfield, my mind races a bit. What might turn up? What will be found? Will that great corkscrew find be mine? And, this year was no different. Instead of getting a good night’s sleep in anticipation of an early wake up call, I was wide awake late last night wondering what corkscrew treasures might present themselves the following morning. Fortunately, and at the lovely bride’s suggestion, I brought our espresso machine with me, and it made the early morning (3 am) a little more acceptable. After a shower and a couple of espressos (three actually) I was in the mini and heading towards Brimfield. It was early–still dark–and I was one of the first cars in the parking lot. There were other early risers out there, but few dealers were amongst them. So, the first 30 minutes or so, really consisted of meandering around, and hunting for more coffee rather than corkscrews. After another cup of coffee, and feeling fairly awake, I walked into a booth and found a nice faceted bow. The price was reasonable (25 dollars) but given the dealer didn’t have change when I offered two twenties, the price became twenty. I meandered this particular field a bit longer, and then looking at my watch realized that a dealer that historically has corkscrews would soon be opening his booth. I headed back towards his vicinity. As he was yet to arrive, I crossed the street and went about looking…for corkscrews. 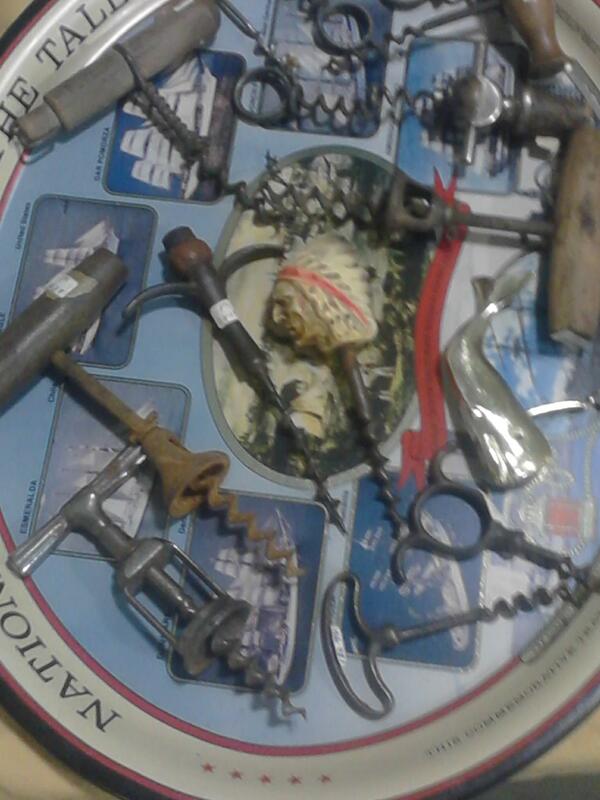 One dealer remarked, “Corkscrews? I could have used one of those last night.” I asked if he ended up finding one, and he went about explaining that that the cork in his cognac bottle broke off, and he was left looking for a corkscrew in desperation. I told him that I would find him one. He smiled, and told me to have a good day. A few more booths down the aisle, I did find a bakelite handled corkscrew with bell assist. It had some finish loss, but it was in working order. I asked the dealer how much, and he explained that it would be ten dollars. I asked him if he would do five, and continued to tell him about his neighboring dealer’s dilemma. He dropped the price to 5; I paid up, and told him where the dealer was, figuring he might partake in the aforementioned cognac tonight. After a few more booths, I happened into one, and saw a small grouping of Cloughs and Cloughs with sheaths. I examined them looking for some interesting advertising, and got more than I bargained for. 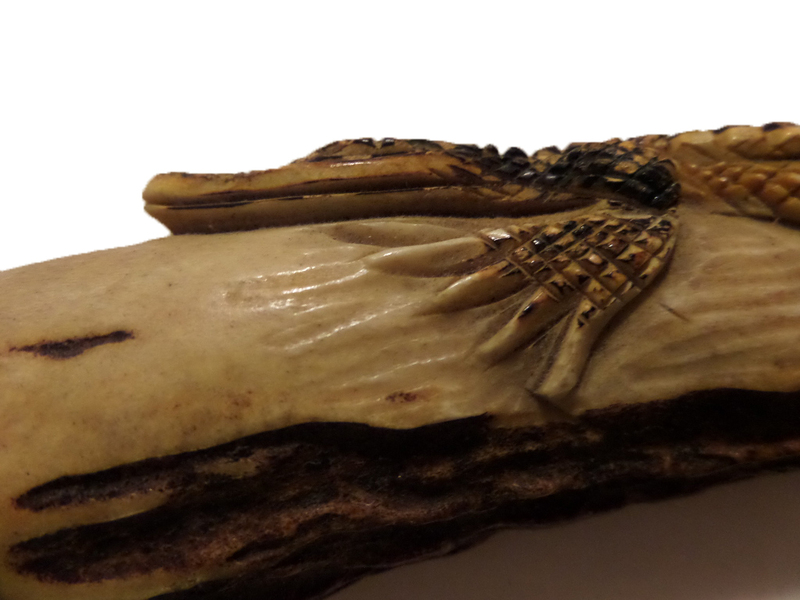 I looked at one sheath closely, and then looked again. 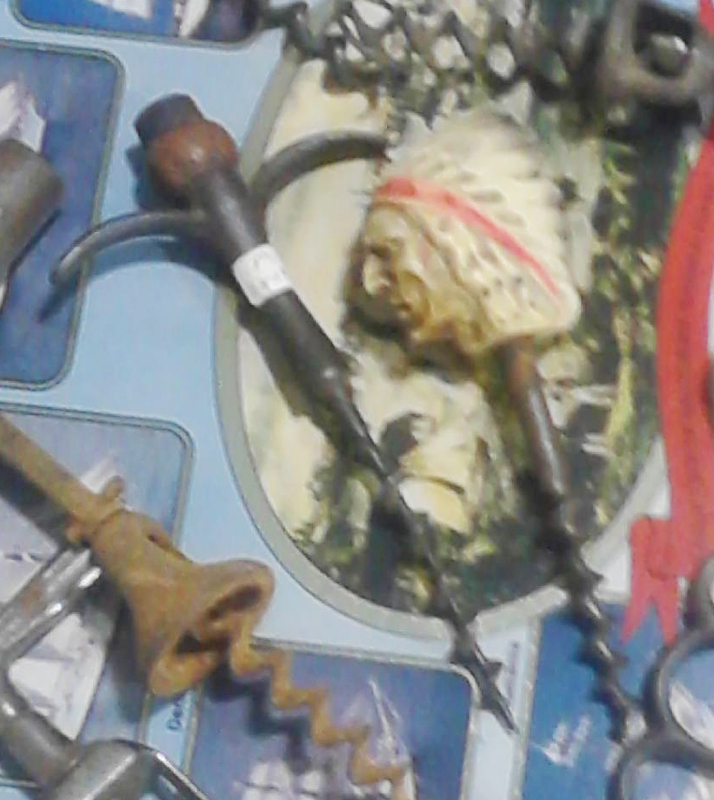 The booth was a little dark, but this clearly wasn’t a normal Clough corkscrew. In fact, it wasn’t a Clough at all. The opposite end of where the corkscrew is inserted wasn’t solid. It was indeed hollow. I grabbed the corkscrew, and set it aside, and checked the others. Satisfied that the others weren’t of similar manufacture, I spoke with the dealer and handed over the asking price. That said, as the booth was rather dark, I couldn’t really make out the end of the sheath, and only after getting back into the daylight did I get to find what I had hoped. 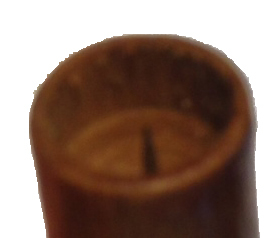 Inside the hollow end of the sheath was a little spike. 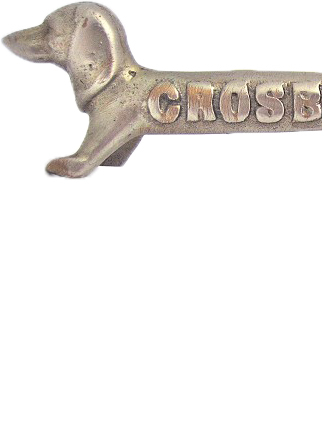 This was indeed not a common Clough corkscrew with advertising, instead it was a A.W. Stephens patent–not common at all, and actually a piece that is rare enough that this could make my best 6 of the year! 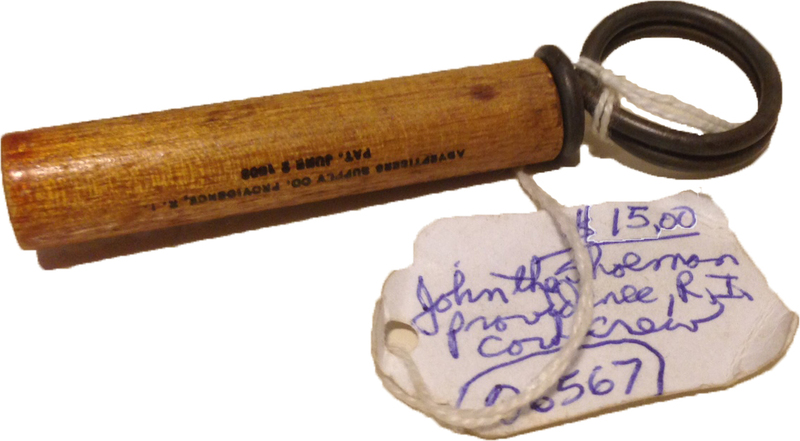 The advertisement on the sheath is for “John the Shoeman, 184 Mathewson St., PROVIDENCE R.I., and on the reverse side of the sheath it also carries the patent date for A.W. Stephens patent; June 2, 1908! With the advertising in excellent shape, and the corkscrew in fantastic shape, I had a certain spring in my step when I went back to the dealer who was having issues with his cognac bottle. 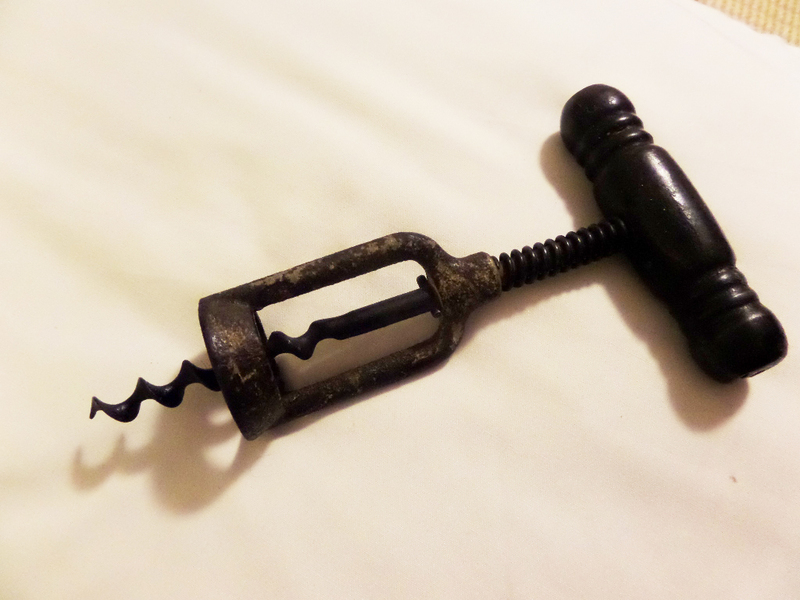 I walked up to him, and handed him the bakelite handled corkscrew. He was definitely surprised, and after picking his jaw up off the ground, he asked me what he owed me. I told him that it cost me 5 bucks, and he reached into his bankroll and paid me for the corkscrew. Having righted that wrong, and with the A.W. Stephens still firmly in my grasp, I hit a few more booths, and then headed to the dealer that usually has some stuff. He did indeed have some interesting little direct pulls, and after a bit of negotiations, I picked up an interesting t-pull. After running into BT shortly thereafter, we discussed the day’s find thus far, and proceeded to hit a few fields together; picking up Noyes patent here, or a (possibly) Sterling roundlet there. The day’s final field had a few corkscrews, but few corkscrew worth buying. Still, with the A.W. Stephens find, I am quite pleased with day 1. And, who knows what might turn up on day two?!?!?!?!?!?! So.. I headed down towards Brimfield today, and an anxiously awaiting tomorrow’s early morning trek to the fields that open at daybreak. However, on my way down, I decided to make a few stops and did pick up two interesting pieces. One, a bottle opener that will probably end up in TWJ’s collection, and a corkscrew with grabber for me. 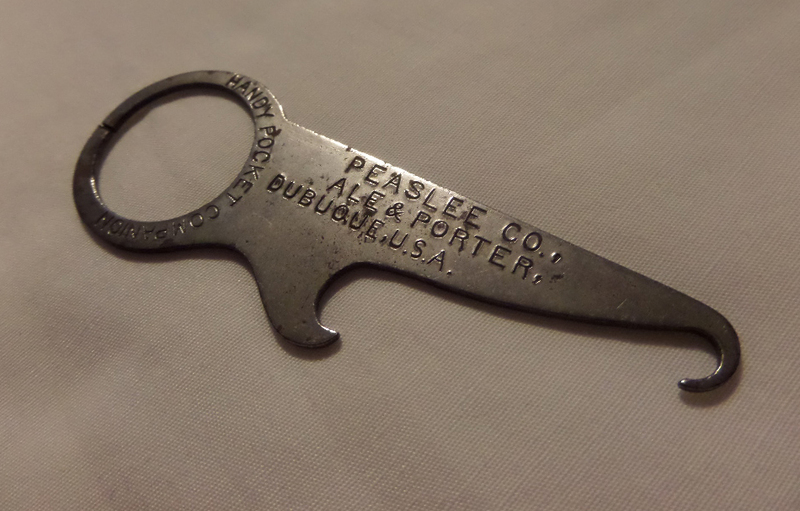 THe bottle opener is interesting as it is an advertising piece for PEASLEE CO. ALE & PORTER, DUBUQUE, U.S.A.
After working out the price with the dealer, I headed off. Of course, not knowing if I had overpaid for said opener, I got back to TWJ, who then responded with a fair price. 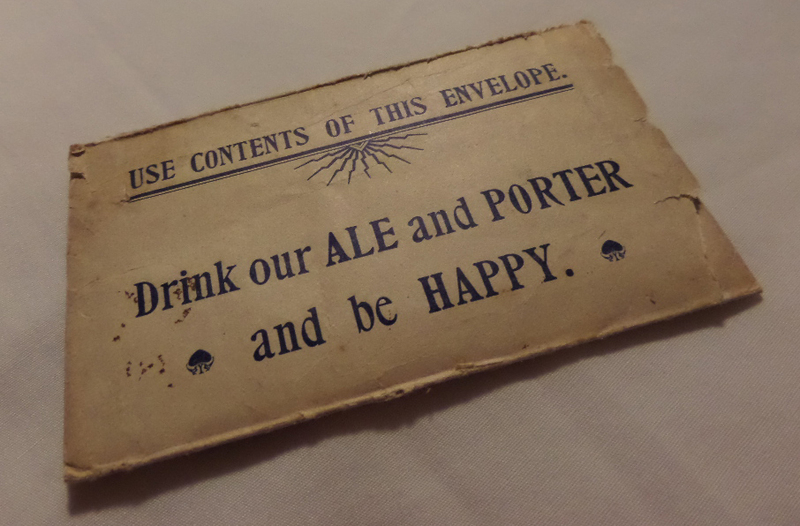 Then, I explained that it came with its original envelope. Of course, then I had to email him to tell him it came with the original directions. His latest response, was a little different, as I think he thought I was pulling his leg. 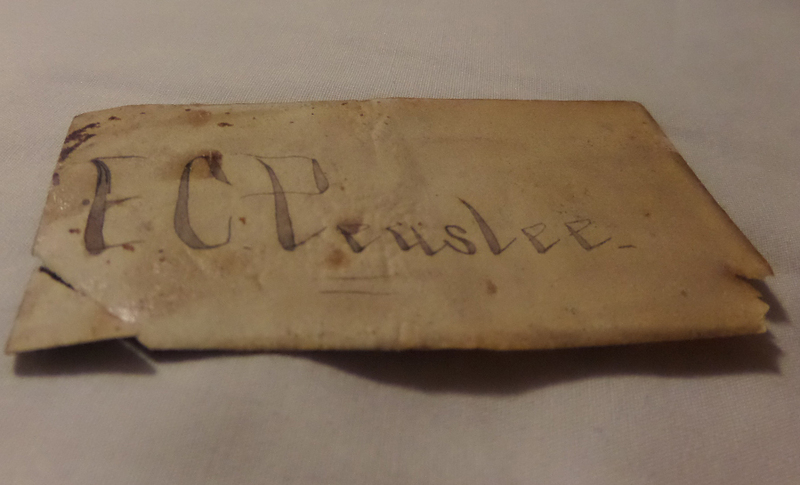 It even has what looks to be E. C. Peaslee’s calling card. 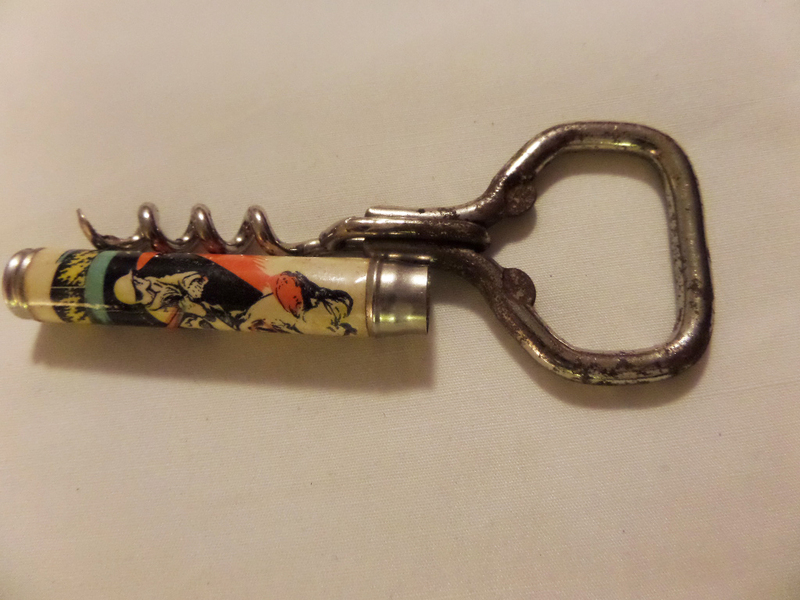 On that note, I did find a pretty good (not great) corkscrew for me. Now, I have had t-pulls with cork grabbers before, but this one is interesting as it is marked on the handle. As I am at Brimfield, with no reference books with, any insights into this one would be much appreciated. More updates tomorrow–and we shall see what $$$ offers (or trade offers) come in from TWJ!! !